As we celebrate 16 years of bringing Soca to London we present a brand new Notting Hill Carnival Mas Band – OMNIA. OMNIA is a Latin word meaning ‘ALL’ and by all means the band represents the same! 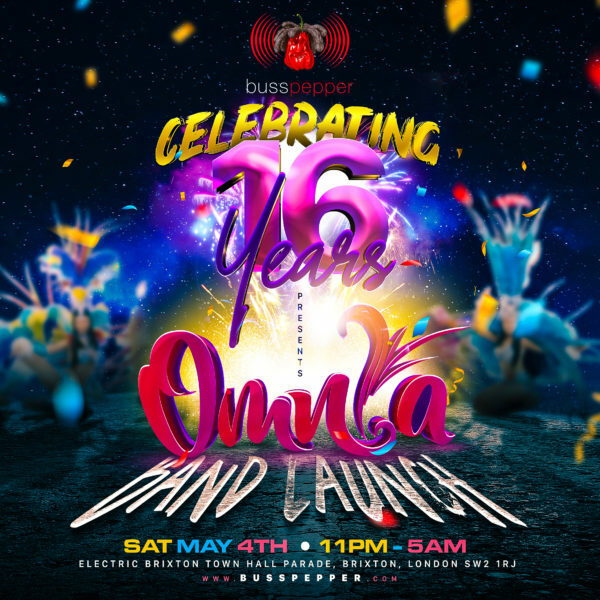 Featuring special guest, Soca 2019’s hottest DJ/producer – Travis World (whose productions owned the road for Trinidad Carnival 2019), Shep Beats and DJ Markee. We’re going all out on production, entertainment and the costume show for this event. Patrons are in for one hell of a show! ID required. No ID, no entry. Doors open 10pm. Last entry 2am. Smart dress code (unless otherwise specified): stylish jeans allowed, only smart trainers, no sportswear. Management reserves the right to refuse entry. Tickets remain non-refundable in this instance. Our general age group is 24-40. We allow anyone over 18 - as defined by UK law - into the event. There is very little on-street parking in the area. Please refer to parkopedia.co.uk for parking info. Yes it is, to another person but not another event. It is not refundable. Tickets will only be validated once, any duplicates scanned will be rejected. Yes, either log onto your Eventbrite account or email us on party@busspepper.com and we'll do it for you. No you don't. The Eventbrite App on your smartphone or the email of the bar code will do. We also have registrants listed. As a standard in the entertainment industry, we do NOT offer refunds . In the case of a transferred ticket, we will admit a person who's name doesn't match that printed on the ticket.